Greetings! It has been ages since I've posted something to Champion City Comics, but now is a great time to update our readers because I have some fantastic news. 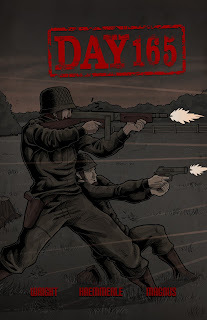 Source Point Press will be publishing a comic book version of our webcomic Day 165, a supernatural war themed title that will appeal to many readers. The concept behind Day 165 is that each episodes deals with bizarre and fascinating things that happen to soldiers during their 165th day of service. I grew up reading GI Joe, Fightin' Army, Fightin' Marines, and The 'Nam. Also, I loved The Twilight Zone and Amazing Stories. It was great to blend war comics with supernatural and sci-fi tales. Day 165 started off as a webcomic in 2012 by Tony Wright (writer), Giovanni Ballati (pencils, inks, and letters), and Joseph Haemmerle (color). We received positive responses from readers and decided to begin a second issue, which would be 24 to 25 pages instead of another 11 page webcomic. There were some ups and downs with getting the comic book developed, but the creative team became Tony Wright (story), Frank T. Allen (script), Joseph Haemmerle (pencils, inks, and colors), and Magnus (letters). We completed the comic book this year and Source Point Press agreed to be our publisher. This is an exciting first step in what I see as an awesome partnership. Please click on the comic book cover below to see our Kickstarter campaign, which ends on October 1, 2016.